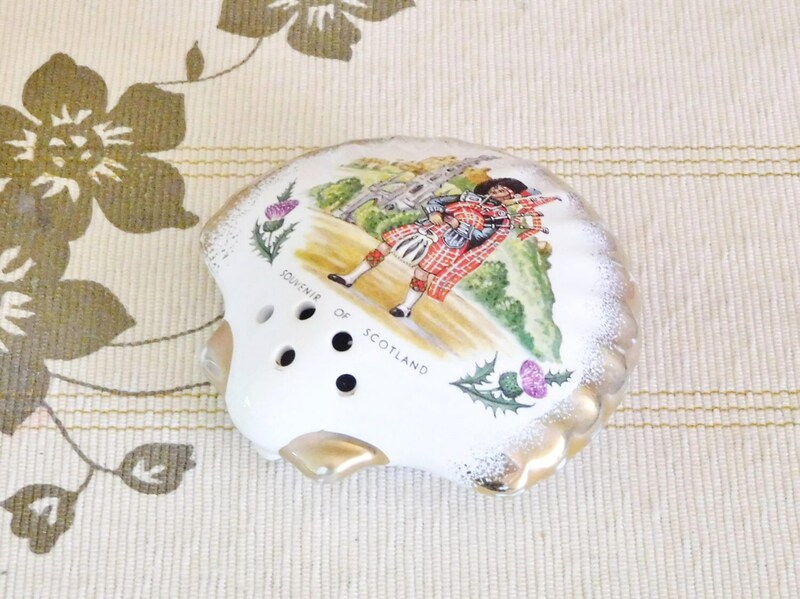 Souvenir of Scotland vintage scenic ware porcelain shell pomander featuring a Scottish gentleman playing the bagpipes. In overall excellent condition though with the expected few signs of wear typical of items this age. 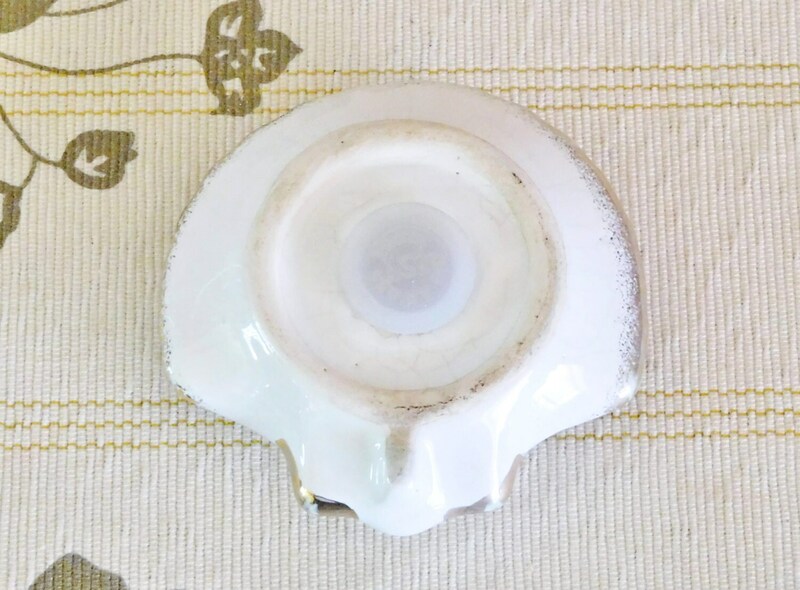 There is some very light crazing around the stopper and some discolouration, but there are no cracks or structural damage. 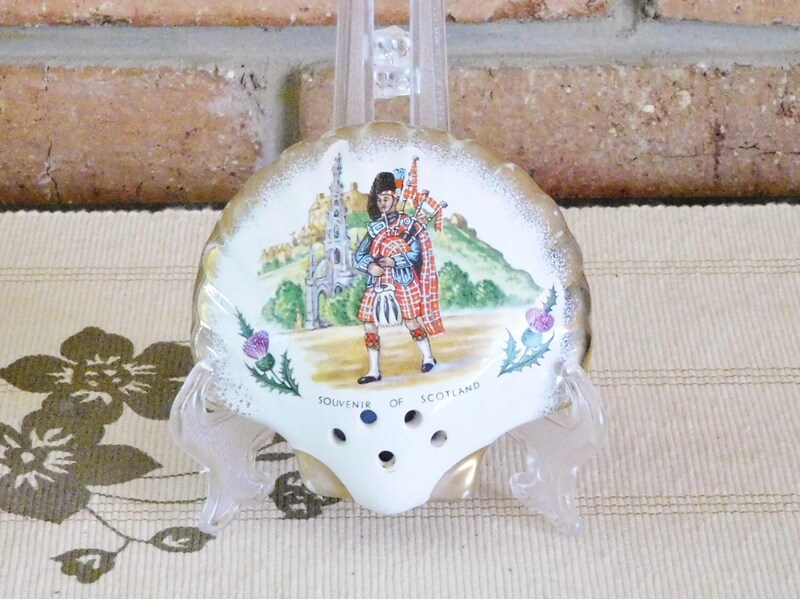 The pomander measures approx. 8/9cm across. Remember, we offer free postage within Australia! And please feel encouraged to ask us any questions at any time! We are only too happy to help. Thank you for shopping with Lizzy’s Vintage Gems! Free postage applies to all items sent within Australia! International buyers (outside Australia) are welcome to ask for a postage cost. Please bear in mind that the cost of international postage reflects both postage itself, size and weight of the parcel, padding and packaging as well as the time taken to send this item with care. As an example, the cost of sending a 1kg, well padded parcel measuring 30cm x 30cm to New York in the United States is over $40 Australian dollars. This is not a price we have made up... it’s what it costs to get something of these proportions out of this country and into the USA. That said, we will save you money wherever and however we can! Use the 'Ask a Question' button to discuss any query that you may have. And remember that pick up from Magill in South Australia (postcode 5072) is always welcome! We thank you for your prompt completion of checkout and payment with PayPal following purchase! Free postage applies to all items bought and sent within Australia! International buyers (outside Australia) are welcome to ask for a postage cost. Please bear in mind that the cost of international postage reflects both postage itself, size and weight of the parcel, padding and packaging as well as the time taken to send our items with care. As an example, the cost of sending a 1kg, well padded parcel measuring 30cm x 30cm to New York in the United States is over $40 Australian dollars. This is not a price we have made up... it’s what it costs to get something of these proportions out of this country and into the USA. That said, we will save you money wherever and however we can! Remember that custom rules vary around the world - we ask that you check these rules as they apply to your country before requesting a postage cost. All items are packed with extreme care and attention to safe transport. Refunds will only be made if the item is damaged in transit and photographic evidence of this is provided. To fulfil your order, you must provide us with certain information (which you authorized Etsy to provide to us), such as your name, email address, postal address, payment information, and the details of the product that you’re ordering. You may also choose to provide us with additional personal information if you contact us directly. •	Service providers. We engage certain trusted third parties to perform functions and provide services to my shop, such as delivery companies. We will share your personal information with these third parties, but only to the extent necessary to perform these services. •	Business transfers. If we sell or merge our business, we may disclose your information as part of that transaction, only to the extent permitted by law. •	Compliance with laws. We may collect, use, retain, and share your information if we have a good faith belief that it is reasonably necessary to: (a) respond to legal process or to government requests; (b) enforce our agreements, terms and policies; (c) prevent, investigate, and address fraud and other illegal activity, security, or technical issues; or (d) protect the rights, property, and safety of our customers, or others. •	Access. You may have the right to access and receive a copy of the personal information we hold about you by contacting us using the contact information below. •	Change, restrict, delete. You may also have rights to change, restrict my use of, or delete your personal information. Absent exceptional circumstances (like where we are required to store data for legal reasons) we will generally delete your personal information upon request. •	Object. You can object to (i) our processing of some of your information based on my legitimate interests and (ii) receiving marketing messages from us after providing your express consent to receive them. In such cases, we will delete your personal information unless we have compelling and legitimate grounds to continue using that information or if it is needed for legal reasons.